Here is what was going to happen: Anne was going to wake up one morning in full possession of the authority she needed to go out and start her life. Anne Arlington hasn’t quite figured out what to do with her life, but while she figures it out she acts as a consultant to parents hoping their (mostly) spoiled, coddled and rich offspring make it into the Ivy League. Even Canadian readers will know that the Ivy League is comprised of eight schools considered, by reputation and name, to be academically excellent, selective, and socially elitist. For those who need a refresher, the schools are Brown, Columbia, Cornell, Dartmouth College, Harvard, Princeton, the University of Pennsylvania and Yale. 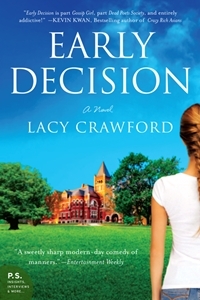 Early Decision‘s author, Lacy Crawford, spent fifteen years working as just such a counselor, coaching parents and high school students through the highly competitive world of college applications and entrance essays. Although the names of the schools will be familiar, the process itself will be less so to Canadian students (unless they have made applications to American schools.) No matter, there’s a little something for everyone in Early Decision. The novel follows Anne’s interactions with five of her students and their (mostly) helicopter parents. For five grand, she all but guarantees her students will get into the school of their (parent’s) dreams. The interesting thing about Early Decision is that the parents often don’t have a clue what their children actually want. These children are often merely an extension of their parents’ egos. Anne isn’t that far removed from this process herself; she’s only 27. As she coaches her students through the essay writing process, she encourages them to consider what they really want for themselves. As a high school writing teacher, I particular appreciated Anne’s attempts to get the students as close to the truth of themselves as they could, to strive for an authentic voice. And I don’t know whether it’s these students in particular or just where Anne happens to be in her own journey, but she finally gets the courage to make a change in her own life. Early Decision was provided to me by the folks at TLC Book Tours in exchange for my honest review. I can honestly say that this is not a book I would have ever picked up on my own, but there’s a lot of great stuff here. The writing is terrific and Anne is a character who manages to see straight into the heart of the people she deals with, yet lacks the confidence to take her own life by the horns. Although the college application process isn’t quite as onerous here in Canada, Early Decision is a great book for people who are on the cusp of adulthood, trying to figure out what they want – juggling their dreams with those of their parents – and eventually figuring out what it means to be true to themselves. I’m glad you enjoyed this one, particularly when it wasn’t one you’d have picked up if not for the tour. My pleasure. Thanks for the opportunity to read the book!